This shift in Mobile delivery in the Google Algorithm this time has a number of people scurrying to figure out what to do. Desktop results are not overtly affected by this update. Luckily for our clients, we either have been working on new mobile ready-platforms to rollout with this change or we were already there. A primary pleaser for Google in this change is a responsive website. They clearly laid out the ground rules in advance and even have provided Webmaster Tools to verify how they are reading you. There are a few approaches to mobile. You can serve a separate mobile version of your website using coding and scripts, or you can develop an application on-web or downloadable on device. Or you can utilize Responsive design. Apps and other content take other plans like content management and app proliferation. Often these approaches require resources to maintain and promote. Google has been abundantly kind to responsive websites in this shift. So let’s examine. A responsive website is one that changes or adapts based on the screen that is reading the page. HTML 5 and CSS3 allows for media queries to identify page delivery based on the size of the screen the content is being served to. 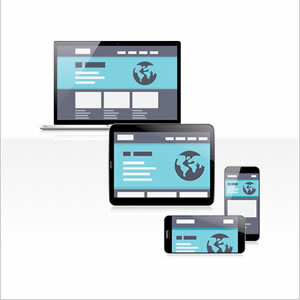 Therefore, good responsive design anticipates and adjusts content to fit the user’s device. If on a desktop, the page has three columns of content, but in the mobile version the columns stack organizing the content down the page instead of in columns. The content adapts to the screen. This is not an update to be ignored. With a growing migration of web users to smaller screens, your web presentation there becomes important. And if your architecture is getting in the way of you being seen in Google’s mobile universe, it is now officially time to update your web presence.